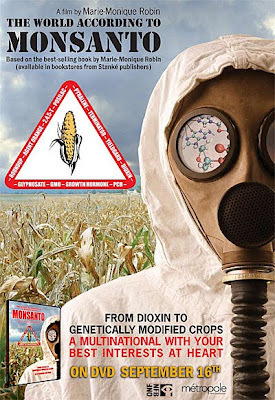 The World According To Monsanto is a 2004 documentary film which makes an in-depth investigation into unlabeled, patented, genetically engineered foods that have quietly made their way onto grocery stores in the United States for the past decade. It voices the opinions of farmers in disagreement with the food industry and details the impacts on their lives and livelihoods from this new technology, and shines a light on the market and political forces that are changing what we eat. The film decries the cost of a globalized food industry on human lives around the world, and highlights how international companies are gradually driving farmers off the land in many countries. Potential global dependence of the human race on a limited number of global food corporations is discussed, as is the increased risk of ecological disasters – such as the Irish Potato Famine (1845–1849) – resulting from the reduction of biological diversity due to the promotion of corporate sponsored monoculture farming. The issue of incorporating a terminator gene into plant seeds is questioned, with concern being expressed about the potential for a widespread catastrophe affecting the food supply, should such a gene contaminate other plants in the wild. Legal stories reported by the film related how a number of farmers in North America have been sued by Monsanto; and the defendant of the Monsanto Canada Inc. V. Schmeiser case is interviewed. The film was written and directed by Deborah Koons, produced by Catherine Butler and Deborah Koons, and premiered on 14 September 2005 at Film Forum in New York City to a full house. The Future Of Food : Documentary ~ Must See !